Before attempting any work on a gas spring or gas spring system the person must have attended and passed the Nitro-Spring training course. Upon completion of the course a certificate of competence is issued. Attempting to perform work on gas springs without completing the course may infringe safety and have a negative impact on the life of the product. Overhaul and maintenance instructions are found in the Nitro-Spring service manual. This manual is available to people who have completed the Nitro-Springs training course. 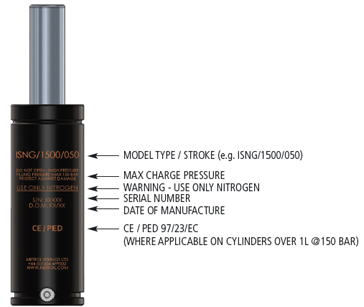 USE ONLY NITROGEN WHEN CHARGING - THE USE OF OXYGEN WILL CAUSE AN EXPLOSION. All NITRO-SPRINGS are permanently marked on the cylinder. Any damage to the Nitro-Spring could affect safety and life of the product. The spring should be de-gassed and disposed of. The nominal stroke listed in the catalogue may be utilised fully, however, it is strongly recommended that 5mm or 10% of the nominal stroke length is not used. This is to prevent ‘overstroke’ as a result of a change in the tool or a mishap. Ensure the gas spring sits on a flat surface. Uneven surfaces can cause side loading or structural damage. Where possible, positively retain springs on a flat surface. Ensure bolts are tight and the spring cannot move. 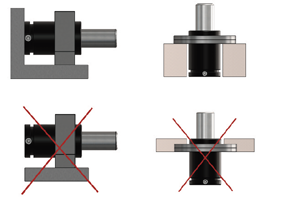 Do not use the threaded hole in piston, this is for maintenance only. Screws must have a clamping length of 2 to 4 x thread diameter and thread depth of 1 x thread diameter for steel and 1.5 x for cast iron. Always use a torque wrench to tighten. Nitro-Springs have a range of fixing elements. Instructions must be adhered to. Incorrect fixing methods may reduce product life and can affect safety. Nitro-Springs must always work completely perpendicular to the contact surface. Side forces will dramatically reduce the life of the product. 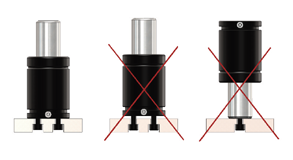 Protect gas springs from liquid or solid contamination. Pockets should be cleaned regularly and equipped with drainage. 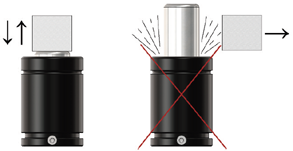 Do not use gas springs in such a way that the piston rod is released freely from its compressed position. This could cause internal damage.